So, you want to experience the beauty of New Zealand, but you’re travelling on a limited budget. While New Zealand is a backpacker hotspot with a favourable exchange rate to many currencies, it is still not particularly cheap. That, however, doesn’t mean it can’t be done – it just means you need to be smart when it comes to tightening the purse strings. Here’s some of our best tips for getting around New Zealand on a budget! 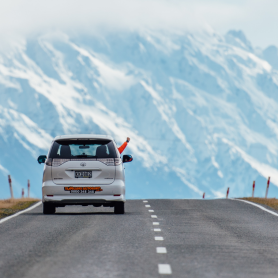 Although New Zealand may look small, getting around it can still be quite time consuming and costly. If you’re travelling for just a week or two, it’s best to stick to either the North or South Island and not try to fit too much in. That way you can avoid the costs of domestic flights, extra fuel, or transport costs, plus have more time to enjoy the experience. On the other hand, if you’re more of a long-haul traveller and you would like to see New Zealand far and wide, you can scale your trip to become cheaper. Plenty of car and campervan rental companies will offer discounts for long term rentals, similarly to accommodation providers. New Zealand is relatively easy to get around, with options such as public buses and car hire being widely accessible. Buses are the cheapest and most common form of public transport in New Zealand, and great for getting you around and between cities. Intercity buses such as the Naked Bus is one of the biggest providers, and fares start from around NZ$10. 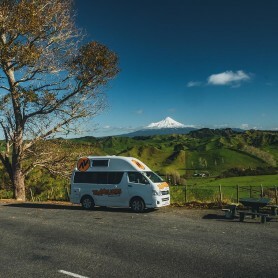 The bus is not always the most adventurous and flexible option way of road tripping, so alternatively many people opt for car or campervan hire. 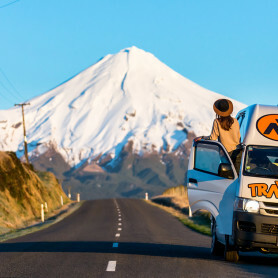 While the cost of petrol in New Zealand is not cheap, camping and caravanning is a still a greatly popular activity for backpackers. There are plenty of places in New Zealand where it is legal and even free to camp in New Zealand, so it can be an extremely affordable option. 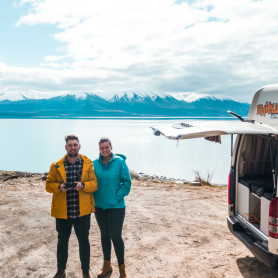 Hiring a campervan means you can sleep in it, cook in it, share the costs with your friends, AND use it to get you from A to B, meaning that overall savings are sure to be made. Like anywhere in the world you might travel, accommodation is one of the biggest costs you will incur during your stay. That being said, New Zealand is a backpacker hotspot, so there’s plenty of budget accommodation options to choose from. Forget the expensive hotels and opt for hostels, cheap motels and campsites. You can stay in dorm rooms for around NZ$27 per night in most cities, and it’s even cheaper to camp! Freedom camping in New Zealand is accessible in many locations, and that means you can sleep among nature and cut costs at the same time. The time of year you decide to travel to New Zealand has a big effect on costs. The price of flights, accommodation, car rentals and more will inevitably be cheaper when there’s less demand for it. The good news is New Zealand is a perfect destination year-round, with no shortage of things to do in every climate. High season (summer) runs from December through to March. There’s a huge influx of visitors during that period so the costs are naturally high. The shoulder seasons from March to May and September to November offer good value and accommodation discounts. From June to October, it’s low season in New Zealand, and the cheapest time to travel. The snow-capped mountains and phenomenal ski slopes make it a nonetheless great season to travel. Just watch out for high prices around the ski resorts. The best way to save money on the road is to cook your own meals. If you eat out you’ll be spending anywhere from NZ$50-150 per day on meals, whereas buying groceries will be a heck of a lot cheaper! Expect to pay as little as NZ$50 per week on groceries if you are cooking your food. Most hostels have kitchen facilities that you can use, and doing so is even a great way of making friends. If you prefer not to be bumping shoulders with others while cooking, get into the wilderness and cook your meal in the back of a campervan! As well as being visually appealing, New Zealand will also stimulate your sense of adventure. A large portion of many traveller’s budgets will go towards adrenaline and outdoor activities, which are unfortunately attached to a high price tag. If you are travelling on a budget, this doesn’t mean you should miss out on such activities, it just means you should choose them wisely. Things like skiing, bungee jumping, sky diving are popular in New Zealand, but the price will quickly add up. Choose what you want to do in advance and stick to that plan. You can also score some deals if you book packages from the same company rather than one offs. Don’t forget, there’s plenty of fun and free activities in New Zealand such as awesome nature walks and sight seeing. You don’t need lots of money to travel – just book your ticket and make it happen!